Football season is officially underway and that means TONS of football watching parties, tailgating and other events. Of course, in addition to the game, everyone is also crazy interested in the food table too. From wings to dips, every good football watching party has yummy food for everyone to enjoy between plays. 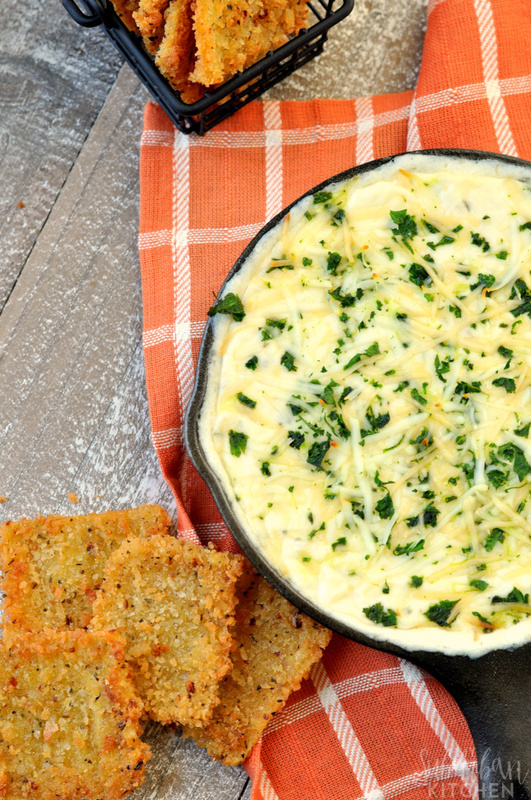 One winner at our house right now: crab Alfredo lasagna dip. 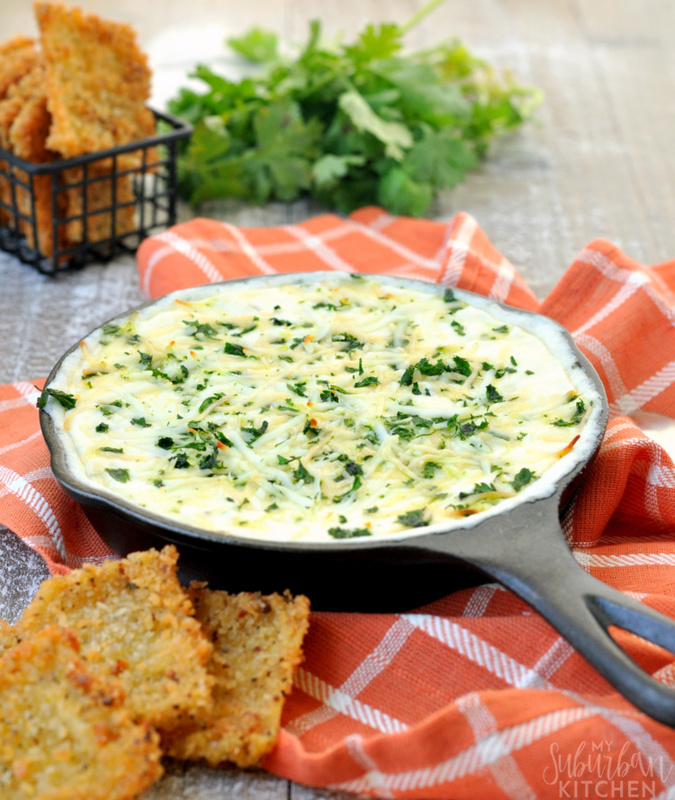 Now, this dip is amazing cooked up in a skillet and served with bread slices. Or, toss it into the crockpot and keep it warm all throughout the game. I even made fried lasagna chips to use as dippers with mine but that is totally optional. 2. Melt butter in a medium saucepan over medium heat. Whisk in flour. Whisk in salt, parsley and garlic. Slowly add in milk, whisking until smooth and completely combined before adding more. Whisk in vegetable broth. Cook for 5-10 minutes, whisking occasionally, until thickened. Stir in 1/2 cup Parmesan and 1/2 cup mozzarella cheese. Remove from heat. 3. Beat cream cheese until smooth. Add in cheese sauce and mix until combined. Stir in crab meat. 4. Spread dip into skillet. Top with remaining Parmesan and mozzarella cheese. Bake for 15-20 minutes or until bubbly and cheese begins to brown. Top with fresh parsley. Note: You can transfer the dip to a crockpot after stirring in the crab meat. Top with remaining cheese and heat on low. 1. Break lasagna noodles into pieces resembling chips. Place in hot water for 1-2 minutes. Remove and dry with paper towels. 2. Heat oil over medium-high heat. 3. Dip lasagna noodles into egg and then into panko crumbs, tossing to coat. Shake off excess crumbs and place in hot oil. Cook for 1-2 minutes per side. Transfer to paper towels to drain. 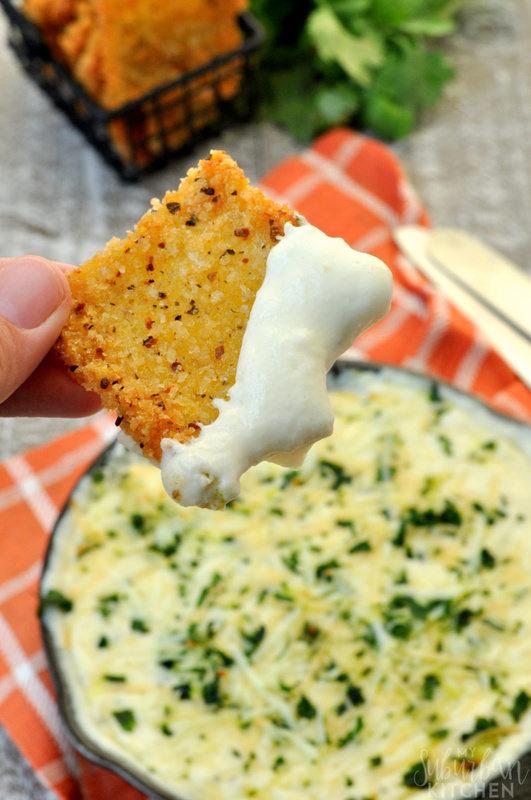 The fried lasagna noodles are such a great dipped for the crab Alfredo lasagna dip but you could also use fresh vegetables, crackers, bread slices or even fried ravioli too! The possibilities are really endless. What are your favorite game day recipes? Do you love having lots of yummy food for anyone watching the game to enjoy too? Melt butter in a medium saucepan over medium heat. Whisk in flour. Whisk in salt, parsley and garlic. Slowly add in milk, whisking until smooth and completely combined before adding more. Whisk in vegetable broth. Cook for 5-10 minutes, whisking occasionally, until thickened. Stir in 1/2 cup Parmesan and 1/2 cup mozzarella cheese. Remove from heat. Beat cream cheese until smooth. Add in cheese sauce and mix until combined. Stir in crab meat. Spread dip into skillet. Top with remaining Parmesan and mozzarella cheese. Bake for 15-20 minutes or until bubbly and cheese begins to brown. Top with fresh parsley. You can transfer the dip to a crockpot after stirring in the crab meat. Top with remaining cheese and heat on low. Break lasagna noodles into pieces resembling chips. Place in hot water for 1-2 minutes. Remove and dry with paper towels. Heat oil over medium-high heat. Dip lasagna noodles into egg and then into panko crumbs, tossing to coat. Shake off excess crumbs and place in hot oil. Cook for 1-2 minutes per side. Transfer to paper towels to drain. This dish looks so creamy and good!! Thanks for sharing!!! 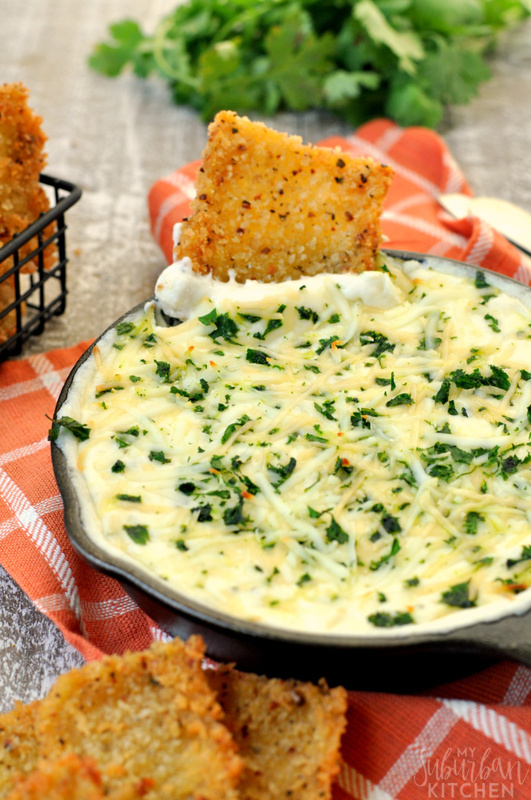 Appetizers and Dips are my weakness! This looks SO good!